He's second to the Pope as the world's most popular religious leader yet the Dalai Lama says he's not interested in converting the West to Buddhism just teaching it how to be happy in a material world. But is Buddhism itself getting too materialistic? The Dalai Lama speaks with Rachael Kohn. We also hear from the first Westerner to be ordained in the Tibetan Buddhist tradition, Professor Robert Thurman, director of Tibet House in New York City (and father of the actress Uma Thurman). Rachael Kohn: The Dalai Lama is a key figure in the Spiritual Revolution that is changing the way we think and believe in the West. He's my guest on The New Believers, the monthly series on The Spirit of Things, here on ABC Radio National. I'm Rachael Kohn. His title means 'Ocean of Wisdom', which he dispenses with ease and much humour to his audiences around the world. But the Dalai Lama, who is the recognised leader of Tibetan Buddhism, is careful not to drown his audiences in too many technical Buddhist concepts. He was chosen at the age of two, in 1937, to be the 13th Dalai Lama and he embarked on a long period of monastic education, which culminated in his final examination before 20,000, qualifying him as a Geshe, or Doctor of Buddhist Philosophy. The Tibetan scholastic tradition emphasises philosophical debate, in the monastery. But outside the monastery other aspects of the tradition are important, such as the possibility that the Buddha can be manifested in people, right here on earth. Through its practices inherited from Indian Tantric traditions, Tibetan Buddhism teaches methods for the attainment of Buddahood in this life (or in a future life). The Dalai Lama may be the Buddha himself, but he likes to emphasise that he's just an ordinary person, as you'll hear. Also on today's program is the first Westerner ordained a Buddhist monk in the Tibetan tradition, Robert Thurman. A delightful man who is sure he was a koala in a past life. Well I don't know about that, but I do know that he is the father of the actress, Uma Thurman. He didn't remain a monk, but he did become an important Buddhist scholar at Columbia University, and is now Director of Tibet House, a cultural institution of the Dalai Lama in New York City. Before we hear my interview with the Dalai Lama, recorded during his trip to Australia, just a reminder that this program is heard on Sunday, and again on Thursday at 7.10pm. Your Holiness thank you so much for receiving me today. When I last interviewed you here in Sydney in 1996, your general outlook was optimistic. Do you have as much optimism about the spiritual well being of the world today? Dalai Lama: Yes, basically the same. I feel that because of very painful experiences which we have learnt in the twentieth century, human beings I think have become more mature. I think, also through our own experiences now people begin to realise the importance of spirituality. Rachael Kohn: The Buddha taught people how to avoid suffering in a material world, and you teach people how to be happy in a material world. Is this a more optimistic way, a more western way, of putting the Buddha's teaching? Dalai Lama: No, actually I always try to promote secular ethics or human values not as a religion, not as Buddhism. Of course to Buddhists, certainly. You see, I explain the importance of the suffering nature, then the causes of suffering, the cessation of suffering, then the ways and paths to overcome the suffering. So I always, you see, emphasise the importance of the realisation of the suffering nature. But my partisan approach that is simply the promotion of human values, not religion, it's not a religious thing. In fact I make this always clear, in order to be good person, a warm hearted person, it is not necessarily to have religious faith. Without religious faith, there can be a nice person, a warm hearted person, and happy person. I think that among the 6 billion, more than 6 billion human beings on this planet, strictly speaking I think the majority are non-believers. Of course officially, "I belong Christian...Judaism..." like that. But strictly speaking, in daily life, I think majority are non-believers. Rachael Kohn: Well, non-practicing anyway. One of the ways which you promote generally, that people can achieve this happiness and avoid suffering is through meditation, which you have outlined as a nine step process and in the final step the ninth step, there is a 'perfect abiding calm'. Is that more of an ideal or a reality? Dalai Lama: No, this one is special training for single pointed mind. So this is not for everybody practice, including myself. I'm very, very, poor in the practice of single pointed meditation, my mind is always attracted to different directions, but amongst practitioners at least whom I know, some practise this practice and again some experience this. Of course, it's certainly not easy and you need a lot of effort. Rachael Kohn: It takes an enormous amount of inner control, you talk about especially the idea of the enemy of peace is not outside but inside one's self. What is your advice then when the enemy is clearly outside, such as today in the post-September 11th world, when we have examples of external threats. What do you advise? Dalai Lama: Well these very unfortunate, unthinkable destructive actions, essentially come out of certain motivations, certain emotions. So these actions also actually are brought about by the inner enemy, that is negative emotion. Basically everybody, every human being wants a happy life, peaceful life. But because of our inner enemy, which for no sort of reason, simply strong emotion. So that emotion, is blind and mad. So therefore, I describe the real enemy is within ourselves. So called external enemies, also these people, once their negative emotion reduce and positive emotion increases, then these people, the same people with the same name, same face become our best friends. So the real enemy is the emotional level. Rachael Kohn: Your Holiness, in Tibet there is one kind of Buddhism I believe and that's probably true of Dharamsala, where you have your headquarters. But in the West we see many kinds of Buddhism. People speak of Western Buddhism. What do you understand by this concept? Dalai Lama: Buddhism, certainly is just one tradition that's come from Buddha. Whether the Therevada system, or the Vajrayana system, originally come from Buddha, within this tradition some little differences and different emphasis are there and different concepts, but basically all come from Buddha. Now the cultural aspects is different. Therefore we call it the original Indian Buddhism, and then later Chinese Buddhism, Japanese Buddhism, Tibetan Buddhism and so on, Thai Buddhism, Sri Lanka Buddhism. Now eventually some people in the West now are showing interest about Buddhism, so eventually Buddhism that [originally] comes from India, from Asia, at the same time [gets] a cultural aspect, a more western cultural aspect, then through that way, then certainly, Western Buddhism. Rachael Kohn: Is that a good thing? Dalai Lama: That's good, certainly, through evolution that will come. But as far as teachings are concerned, they should be very authentic. There are some cases, what are they called New Age or something, that I think we must be very, very careful. If you call something a new religion, then of course, that's alright, but if you call something Buddhism, it must be very authentic. Rachael Kohn: In the West there are not many monasteries, Buddhist monasteries. In fact in Christianity, monasteries were dismantled and monks and nuns went into the world, not very much away from the world. Do you see any signs of this occurring in the Sangha (community of monks and nuns), a dismantling of monastic life? Dalai Lama: Of course in the West there are very few Buddhist monastery and nunnery, and in a few cases very few monks and nuns. Whereas in Thailand, and Sri Lanka and Burma, still I think very strong traditions remain there. So too the Tibetan community, also generally speaking I think, still quite strong traditions remain there. I think one factor in India now, in our bigger monastery, monastic institution, the new students who enter the monastic institution, now recently the larger numbers come from Tibet, not from our own refugee community children. So now, that's an obvious development. So children in India, Tibetan young children who got an education in our school prefer some other work. Rachael Kohn: Many years ago you dispensed with some of the traditional ceremonies associated with your role as the Dalai Lama. Why did you do that? Dalai Lama: Actually there are some ceremony, form of ceremony, that I don't like, and don't have much meaning. After all we are refugees. Of course the way of giving teaching to the public, I always carry it in a complete informal way. I believe the formal way is sometimes an additional obstacle or barrier to communicate with another, one another. And I don't think when Buddha himself sat there, I don't think there was any formality. I don't think any elaborate ritual things. Buddha himself always went as "just a simple monk" and he'd give teachings according to circumstances and that we should follow. Rachael Kohn: What do you think the Buddha would say to the Maitreya Project, the building of the world's biggest Buddha at the cost of $US 200 million in Bodhgaya. A place that doesn't even have sanitation, Do you think that's consistent with the Buddha's way? Dalai Lama: I can't say on behalf of Buddha. if he was alive today. I don't know. Of course on the human level, there are two opinions. One opinion, of course now is the construction of the Maitreya Buddha. So inevitably, this is, I think one important way to accumulate virtues. The other view is rather critical. As you mention while millions of poor people, especially young children without any education or any proper school and health-care why is it the spending a lot of money on the construction of the statue, better to spend it on health and education. That I think is quite well thinking. So my own view, since this project is already initiated by Lama Zopa Rinpoche, as a buddhist monk, any work of construction of a buddhist statue, is of course positive. So therefore I support it. And meantime I made very clear to the concerned people, now with that project the local people should get some benefit, so they've planned accordingly some education facilities and also some other sorts of project that will be of benefit to the local people. Rachael Kohn: Your Holiness, people looking at the Buddhist web sites see that there are many things to buy, many ways to give money. Some people think Buddhism itself is becoming too much a part of the material world, maybe that's because some Hollywood stars are becoming involved in it as well. Is Buddhism becoming too materialistic? Dalai Lama: That depends on the individual. Buddhism itself, of course as a man of Buddhism, is a way of thinking, a way of life, a way of guide, and especially I think a proper way to confront our negative emotion. That will remain, that is Buddhism. But the construction of temples or construction of monasteries these are of course a part of the activities of the Buddha Dharma but not Buddha Dharma itself. Buddha Dharma means 'mental quality', so it's not a money matter. We can't buy with money, mental quality. So mental quality must develop through training your mind. Not by injection or straining your mind. Those people who have great merit, they may find it more easier and less obstacles, otherwise only through training your mind. Rachael Kohn: Robert Thurman is the ebullient man who heads up Tibet House, the cultural institution of the Dalai Lama in America. Located in New York City, it's a drawcard for the rich and famous as well as ordinary folk who want to use its library or look at the excellent collection of Tibetan art in its gallery. Thurman was a very popular professor at Columbia University, but now he spends most of his time at Tibet House, receiving guests, giving lectures and raising money for Tibetan refugees. I caught up with him last year, just before the attack on the World Trade Center, a few blocks away from Tibet House. Here Bob Thurman explains why the Dalai Lama takes his message around the world. Robert Thurman: The irony is that although he goes at the invitation of Buddhist groups, he very adamantly is against proselytising Buddhism and changing Christians or Jews, or even secular humanists into Buddhists. He appeals to other world religious leaders, 'Please, please, let's not have new religious competition', which they don't heed too much in fact nowadays. But he continuously makes that plea and he'll give a Buddhist talk to lots and lots of people and he'll spend the first ten minutes of an hour about how he's not giving them this talk because he wants them to be Buddhist, he wants them to use anything that they find that's useful for their lives, he wants them to enjoy their lives more, he wants them to control their mind to find peace. He talks about the common human religion of kindness, this type of thing, and he says, 'Don't become Buddhist', actually. Everyone gets so puzzled but I think it's good for them, he stimulates a little bit of cognitive dissonance. Rachael Kohn: Nonetheless, wouldn't it be fair to say that he's stimulated their interest? Is the star of Tibetan Buddhism on the rise? Robert Thurman: Well I think yes. But you have to realise that when you say that, that the star of Tibetan Buddhism has risen, you're talking about zero to 50, because it was zero 20 years ago, or 25 years ago, there was no knowledge of Tibetan even 40 years ago, except as some sort of faraway thing with a Yeti, you know, the Abominable Snowman, or something like that. And so the fact that Tibet has become known more widely by the presence of Tibetan refugees everywhere, it's something about Tibet giving a new boost to the Buddhist interest that was already there, stimulated by Zen, by Therevada Buddhism, by Chinese Mahayana Buddhism, and Tibet then sort of built on that. And what Tibet really has brought is the kind of original Buddhist matrix that existed in India. Because Tibet was the country where Indian Buddhism went lock, stock and barrel, a thousand years ago when it was wiped out by various invasions in its homeland, which was India. But not that many have really said 'Oh, now I'm going to leave my other kind of Buddhism and become a Tibetan Buddhist', very few. And the Tibetan Buddhists don't actually encourage it. Rachael Kohn: Tibet House has attracted the attention of a lot of celebrities. Have you consciously gone out to seek their support? Robert Thurman: No. We haven't gone, in Tibet House, particularly to seek celebrity support. Of course in any non-profit, when you do get celebrity support, that's when you can begin to become viable as a non-profit, because the way America works, the way our democracy works, we don't have any Princess Di, you know, we don't have a Royal Family, so charisma is focused on theatre and film celebrities, and therefore when you can attract one, when they do become interested in Tibet, then Tibet House, and they will come to Tibet House functions, then more people will come to our function, and we will be able to develop a sort of fiscal viability. But the person who attracts them though rather is His Holiness the Dalai Lama, and Tibet House is his cultural centre, so that it natural some will help us on the cultural level. Mostly they have worked on the political level, you know, testifying in Congress and helping the refugee situation, and we're sort of third in line, you could say, amongst the Dalai Lama's institutions in America. Rachael Kohn: Western spiritual thinking is often associated with a certain degree of self-centredness; to what extent do you think Buddhism is an antidote to that? Or in fact, does it promote it? Robert Thurman: Buddhism can be exploited for self-centred reasons, it's just like any other thing can be exploited. There is no thing made by human ingenuity, and human ingenuity cannot subvert and exploit as well. However Buddhism may be almost the hardest thing for self-centredness to exploit because the foundational philosophy of Buddhism is expressed as selflessness. In other words, that's a philosophical and also an ethical term in Buddhism that is absolutely central and they constantly harp on it. They sometimes talk about emptiness, selflessness, you know, egolessness, they have all these terms. So although the self-centred people still manage to use Buddhism in a narcissistic way, it's hard for them, because they're constantly harping on that you have no self, that your self-obsession, or self-occupation is your worst enemy and so forth, it's constantly reinforced in Buddhist teaching. So although it makers it very difficult, it's still not foolproof. Rachael Kohn: How well do you think Westerners understand that concept of no self? Robert Thurman: Well I think not only Westerners, I don't think Easterners understand it very well. I think it is something which is actually rather hard to understand viscerally. It is actually easy to understand intellectually, and in a way modern materialistic culture and science agrees with it. For example, most modern people who are materialistic, I don't mean they're greedy, I mean that philosophically, they believe that when they die they will cease to exist. Like if you want to find your social security number engraved somewhere in your heart valve, so you won't find it, you won't find a barcode on any particular joint of the spine, you know what I mean? You won't find a neurone that says 'Rachael', or that says 'Bob', it won't be a Bob neurone. And that's easy to understand intellectually. But then again, we appropriate our experience from the point of view of a functional self centre, and therefore we sort of then have a hard time connecting that intellectual understanding that there's nothing we can find easily that really is this durable self to the feeling of being a durable self. And that's where Buddhist meditation and Buddhist critical thought and Buddhist ethics even, becomes a long, gradual, slow process of making visceral that intellectual understanding, and I might add, avoiding the mistaken idea of nihilism which modern materialism falls into. They think, well I don't really exist, so therefore nothing matters, so it doesn't matter what I do' type of thing, which is eat, drink and be merry, tomorrow we may die, and after we die we're not going to be anything, so there's no consequence. They usually don't have to finish the sentence. And so that aspect is not easily understood, and that's where all of the Buddhist methods, and all the Buddhist education focuses on that element. Rachael Kohn: Almost going to the other side of the spectrum, Tibetan Buddhism is quite fantastical, it's filled with incredible magical scenarios, reborn Lamas and deities; how easily can Westerners believe that stuff? Robert Thurman: It's hard for Westerners to overcome the disbelief in future life and former life which they inherit from their scientific upbringing. Buddhism presents the existence of an individual life as part of a continuity of lives, many past lives, like you and I have been all different kinds of animals, dinosaurs, I'm an American but I've even been a koala bear, you know, speaking of Australia, in a former life, I've definitely been a koala bar, and so on. And that's very hard for Americans, because we' re taught that there is no irreducible spirit and therefore when we die, the body dies and the brain ceases, that's the end of you. But, and therefore I often say when people ask 'How come Buddhism is sweeping America?' or something. I say, 'Buddhism is not yet at all sweeping America', because Buddhism is not just a few religious practices, it's not just a few abstruse magical tricks or beliefs, Buddhism is a different vision of life, including a different scientific vision of life, and it sees life as an evolutionary continuum where individuals are born and reborn infinitely actually. We'll have infinite future life, we had infinite past lives. And until that belief from the Buddhist point of view, until a person feels comfortable, feels almost at its commonsensical, that belief, that person cannot be a Buddhist actually. Rachael Kohn: Bob Thurman, how did you come to believe that it was a commonsensical view? Robert Thurman: Well it took time, actually. At first I intellectually thought it was quite acceptable, because after all, no-one has ever proved that anything becomes nothing, or anybody becomes nothing, no- one has ever heard about it. Carl Sagan is not around to verify that he became nothing. So I was open to it intellectually for that reason, but after almost a year or two of practising Buddhism and intellectually trying to hold that view, it was pointed out to me by one of my teachers that viscerally I did not hold that view, and I really only lived for what I would get out of, and I did things for what I would get out of them just in this life, and I basically considered my worry and my responsibility and my positive option even, positive horizon, was only whatever I could do or become or achieve in this life, because I really didn't viscerally think I would be facing situations after leaving this body. But after a few years, I had a funny experience as I was walking along, buying some milk at the store for tea, for the monastery where I lived, and as I was walking along, I suddenly felt as if a pressure pushing me was had been taken away from me. In other words I suddenly realised that I had been living as if there was a beginning to my living, and I was being pushed by that beginning in a sort of a rush to get somewhere. And suddenly I realised there was nothing behind me pushing me, and there was endless space behind me. I came from an endless past, and I suddenly realised that I wasn't really rushing, there was no point in rushing to get somewhere, I would get there and I would get that milk, and there would be many more expeditions for milk for many more cups of tea. And it just changed the way I lived, the pressure of the way I had felt, the driven- ness of the way I was living, basically. And that was kind of revelatory for me, and ever since then, the idea that there would be future experiences and future problems and future considerations, became commonsense to me. Just like for example right here in Tibet House, I feel it's commonsense that 15th Street is still out there. I can't prove it's still out there, somebody might have blown it up in a bomb, you know, or the world might have dissolved, but I think it's there, sort of, without having to invest any energy in that, it's part of my world picture. Similarly future existence is like that to me nowadays, and to me, a person who would think that there's a yawning nothingness waiting out there for them. The burden of proof is on them because that's a very abstruse thing to think. Rachael Kohn: Can't you also feel driven to do things for its consequences in a future life? Robert Thurman: You can, but you have a little more time. The driving-ness is a little slower, let's say, but on the other hand, of course yes, this is a very important point. I used to debate with Carl Sagan a little bit, I had a little debate with him because he was very bent that there was no future life, and that was very crucial to the scientific world, he felt. And in that little bit of a debate, I noticed that he was assuming that people who believed in a future life were taking it easy, therefore, he thought things would be taking care of them, like it was a naïve childish notion of immortality, so they didn't really strive in this life. Whereas I pointed out to him that people who have a notion of future life are worried about coming into a negative circumstance or having an unhappy future life. That increases the possibility of negative possibilities by a huge factor, and therefore by having future existence, did not relieve you of the burden of concern for how, what would the quality of that future be. And in fact what the Buddhists have discovered is that can drive you to be more virtuous, to be more kind, would not be hostile to people because they might get you later, you know, even if you escaped them in this life etc. It in fact encourages people to behave a little bit better, a lot better, because they can't come with that idea of there'll be no consequence of what I do, therefore what I do ultimately won't matter. Everything matters if you have an endless consequence. CHANTING Rachael Kohn: That's Robert Thurman, scholar of Tibetan Buddhism, and Director of Tibet House, the cultural institution of the Dalai Lama in New York City. You're listening to The New Believers, Leading the Spiritual Revolution, the monthly series on The Spirit of Things, here on ABC Radio National. Bob Thurman, you were the first Westerner to be ordained as a monk in the Tibetan tradition, and you were educated under the watchful eye of the Dalai Lama; has that made you something of a celebrity? Robert Thurman: I don't think so, because I'm also the first person to resign from having been a monk. You know, it's embarrassing to me, I don't like to promote the idea that I was the first person ordained as a monk, because I then did resign after a few years, which did upset His Holiness, and more than him, the older teachers who had also ordained me. But eventually they accepted that decision, they realised that the type of life that I faced here in America at that time, in the '60s, wasn't really ready for a sort of pale white monk with an extra large head, you know, shaved like Kojac or something, they weren't really ready for it, and so they accepted that decision of mine, although I regret that I wasn't able to maintain. You do take the monks' vow in the Tibetan order for life, and it is considered a little bit shameful to renounce it if you have once taken it. So therefore I don't consider myself a celebrity, I consider myself a slight bit of a disgrace, to be honest. Rachael Kohn: Well then, tell us why did you resign as a monk? Robert Thurman: Because it seemed well, I fell in love with a beautiful woman, that's my human weakness. On the other hand she won't accept blame or responsibility because I had decided anyway, that being a monk without a monastery, and there is no monastery really in America for Euro-American Buddhist monks. Some Tibetan refugees come and they make sort of an ethnic monastery for their people, but there's really no social set-up for Buddhist monasticism for Euro-Americans in America yet. That's another reason why I don't consider Buddhism really sweeping America in any such way, I think that's media hype. Rachael Kohn: Do you have any reservations about the monastic system? I mean what if we all became monastics? Robert Thurman: If we all became monastics I would have no reservations about that, it would be excellent if we all became monastics. If we all became monastics, then we would level off the population problem, it would be definitely levelled off. We would be all living at a higher level of ethical kindness and gentleness, and pretty soon a few of us would resign and then there'd be a little bit more appropriation probably after that. And ex-monks and nuns make good parents actually, they're more kind usually to their children, because by having been a monk or a nun for a while, they get rid of some inherited family authoritarian behaviours that often descend in secular families. I'm sure you're familiar with what I'm talking about. And so I think it would be just fine if everybody became a monk or nun, it certainly would give the planet a break. Imagine the human population curve decreasing, getting back to one or two billion, just by people voluntarily renouncing procreation for a couple of decades, but within a few years, many would resign and you would still have a little bit of procreation, so not to worry too much. Rachael Kohn: Well isn't there a bit of a contradiction in that? Because monastic life relies on the generous contributions of people who work hard and make money. Robert Thurman: Well that's because not everybody is a monk you know, so many people do work and make money, and then some people who make money realise that the purpose of life is not money, and rather the purpose of money is to have a handsome life and part of a handsome life is to be generous and to give and to support non-profits, especially those that seek to preserve a culture, to preserve the environment, to preserve the world to diminish domestic violence, to reduce the population growth that is so destructive to the planet etc. and so the point is, there's really no danger of everybody becoming monastic to start with, and second, furthermore you know, if everybody were monastic, that doesn't mean that everybody would do nothing. In fact monastics produce tremendous amount of value in history, voluntarily. They've created an enormous amount of art, they've created a tremendous amount, the medical systems of most of the countries were developed by monastics; in the West too, until the Protestants destroyed monasticism in Europe. In Asia monastics were great healers, and incredible people. So before we dismiss monasticism out of hand based on the Protestant ethic which we have inherited, in our over-industrialised societies, we should think more carefully about what it means as an institution. That's one of my main academic points that I have written books about. Rachael Kohn: May I ask you then, do you have any reservations about a kind of Westernisation of Buddhism? Robert Thurman: I don't have reservations about the Westernisation of Buddhism because I think that Buddhism is more than a religion. I do think that in the current era I follow His Holiness, the Dalai Lama in thinking that it is not correct or necessary, or even beneficial, to proselytise Buddhism and like convert America to Buddhism or something, as a religion. I completely agree that people should use Buddhist philosophy, psychology, ethical ideas, even social advances that the Buddhist societies advance, particularly the non-violence social advance that Buddhism developed so well in so many countries, I think these should be used, but they can be used perfectly well within a Jewish or Christian or secular humanist matrix. If you add Buddhism as a religious institution and try to sort of go in and start competing with the Baptists and the Methodists and the Orthodox and the Reformed etc and the Muslims, then we're talking new religions wars, new religious competiton for market share. I think that's very, very negative and unfortunate. Buddhism actually is not just religion, it is not just a religion. Buddhism is defined as composed of a special kind of ethics, a special kind of meditation, and a special kind of science and wisdom. And the ethics of the science are not religious, and they should interact with our educational institutions and with our legal institutions, and promoting the idea respectively of non-violence and the idea of individual insight into the nature of reality which is very, very crucial, I think for us all to gain. And those aspects can be widely used and Westernised would mean that Western people would develop their wisdom and would develop their ethics, and that to me is very, very crucial. And so I have no reservation about that at all. But I have many reservations about the attempt to appropriate Buddhism as a new cult, as a new sort of membership group, as a new sort of 'in' group, you know, we versus them type of thing, and sort of what one Buddhist teacher calls spiritual materialism, you know having malasand wearing red costumes and doing this sort of thing. I have lots of reservations about that, certainly. And I also have reservations about some ideas within some Buddhist writers who like modern times, you know, Westerns would say 'Oh we can be Buddhists, but we don't have to worry about forming a future life, we can be Buddhists and yet materialists.' Or they say, 'Oh we can be Buddhists, but we don't need monasteries any more, that's old-fashioned, we want everybody to work'. And so that's the modern ethics, that 'We'll be Buddhists and yet we'll be secular Buddhists'. I have much reservation about that. Rachael Kohn: But isn't that inevitable that when Buddhism comes to the West, it will change, just as it did when it went to China and Korea? Robert Thurman: No. When it came to China Buddhism, the Confucianism and Taoism that existed before Buddhism came there had no such concept as monasticism for example. It was considered disrespectful to your parents to shave your head, because the hair was inherited from the parents, and everyone had to work in the Confucianism thing, and had to do what, worshipped ancestors, this sort of thing. There was no such tradition in China like there was in India. And Buddhism brought that tradition to China, and actually that tradition created a social escape valve for many women who didn't have a role except in a village working more or less like slaves, for many men who didn't want to fight in armies or who had some higher aspiration than just planting seeds, and it created a kind of matrix for what we would today call kind of liberal education where you would go and open your heart as your own purpose in life. But Buddhism institutionally did create that over several centuries in China and Chinese Buddhism then flourished for thousands of years, and so Buddhism did create that change there. Now in the West we have a special unique thing where we do have Catholicism, which does accept monasticism and many monks and nuns do a great deal of useful things besides spiritually purify themselves in the world. But the problem is that industrial culture has gotten all on its high horse with its technical mastery of things, and destroyed monasticism in Northern Europe, it became extremely militaristic, it has a bit triumphal attitude that we should all be secular. Meanwhile it's facing a population explosion that is planet-destroying, a consumer pollution level that is planet destroying, and we all know about the nuclear and the high tech military weapons that loom over everybody's head, so we still are very much endangered actually by not allowing people not to produce, not allowing people to be free to pursue their spiritual development, and therefore Buddhist monasticism in industrial Protestant countries, and other countries that have adopted that ethic, would be able to reinforce say Catholic monasticism and the general idea that some people should be free and peaceful in life and should pursue their spiritual fulfilment, and that that's a worthy thing for them to do, which is something that the Catholics have maintained, but is very weakened in our country. You know you have Thomas Merton's monastery has 25 monks on 2,000 acres. They could have 500 monks, easily. In Tibet they would have 5,000 monks actually. And that country flourished and never had famine and never had extreme poverty until invaded 50 years ago, with a high degree of monastic population, very balanced population curve, minimal destruction of their environment, and a very peaceful life, even if a little unwashed, as the Dalai Lama likes to say. Rachael Kohn: Bob Thurman, the building of the Maitreya Project and other huge Buddhist temples are meant to draw pilgrims and tourists. Is there any worry that this is becoming a hugely competitive, even materialistic expression of Buddhism? Robert Thurman: Well, religion is ludicrous, all religions are ludicrous from a certain point of view, from a materialistic point of view, right? I mean go to any - the Communists for example destroyed 6,250 monasteries in Tibet by saying that 'Putting all this gold in these statues of these Buddhas and things, this is ludicrous, you need the gold, you need the money, you can invest it in a sock factory or something you know.' And in 1980 when the late Chinese leader went to Tibet and saw what a disaster the Chinese colonisation and invasion had wrought there, he gave the Tibetans total tax exemption and totally let them do what they want, and to his amazement instead of starting laundries, they rebuilt some of those monasteries that he had destroyed, that Mao had destroyed. 350, 400 years, right? But what has it gotten us, these utilitarian things? A couple of flush toilets, yes, but it genocided the native Americans, enslaved the African American, it is threatening our environment with pollution, it is threatening our whole civilisation with militarism and with high tech weapons, and heaven knows, genetically altered food. Heaven knows what even is in our own intestine at this moment. And so too much utilitarianism seems to also put things out of balance, you see. So the idea that somehow the spiritual destiny of the human being, and the condition, internal condition of the being of hope in the future, and a feeling of viability of life, that is just as crucial, the feeling of viability of life, that is just as crucial as some toilets and some other things. So there should be a balance, shouldn't there, between some sort of spiritual investment let's say, and actually a spiritual investment really finally should take priority because this is the great Buddhist insight, you know. If you have a bad mind, it's just filled with surging impulses that you have no control over. You can be in the most beautiful mansion, with the most beautiful automobile, with a beautiful, well you won't have beautiful relationships because you'll be such a pain you'll drive them all away, but maybe temporarily you'll have some relationships, and you will still be miserable yourself. You will have to be on Prozac, you'll be on something because your mind will be discontented with whatever it is. But if your mind is controlled, you live in a modest place, now you don't have to be in a sewer, you can be in a modest place, you can be peaceful, you can be contented, you can find something beautiful in a little pot of flowers outside your window, like a little old lady in Kyoto or something like that. Fine. Because the mind is balanced, the spirit is satisfied, do you see? There's a famous writing from a thousand years ago, it says, 'If you don't like stepping on sharp things when you walk around town, you have two choices: cover the whole surface of the town with leather. That's one choice. Or make yourself a pair of shoes, that's the other choice. Which is more practical? Rachael Kohn: Two different points of view; which would you choose? That was Robert Thurman, Buddhist scholar and Director of Tibet House, speaking to me in New York City. 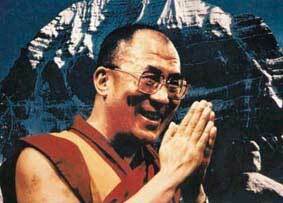 The Dalai Lama's message to the West is how to find happiness in a material world. No-one would doubt that the West has been the most successful in making material wealth available to more people than anywhere else. But the East is no stranger to material extravagance. So when Lama Zopa Rimpoche announced that he was going to build the world's biggest Buddha at the pilgrimage site of Bodhgaya in the Indian State of Bihar, at a cost of $US200-million, it caused a heated debate. Rachael Kohn: Before Bob Thurman we heard from the one and only 'laughing Buddha', the Dalai Lama. He's been our special guest for this edition of The New Believers, Leading the Spiritual Revolution, a monthly series on The Spirit of Things, here on ABC Radio National. Now you'd expect his mental training to give him a pretty good memory, but I didn't expect the Dalai Lama to remember my hairstyle from six years ago. Rachael Kohn: A man who I think proves that holiness and humour can go together.